Reference to this, and to his leadership qualities, is made here in a Testament to George Knowland by Jack Cox No 12 & 3 Cdo. War Office, I2th April 1945. 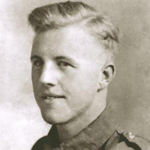 In Burma on 31st January, 1945, near Kangaw, Lieutenant Knowland was commanding the forward platoon of a Troop positioned on the extreme North of a hill which was subjected to very heavy and repeated enemy attacks throughout the whole day. Before the first attack started, Lieutenant Knowland's platoon was heavily mortared and machine gunned, yet he moved about among his men keeping them alert and encouraging them, though under fire himself at the time. When the enemy, some 300 strong in all, made their first assault they concentrated all their efforts on his platoon of 24 men, but, in spite of the ferocity of the attack, he moved about from trench to trench distributing ammunition, and firing his rifle and throwing grenades at the enemy, often from completely exposed positions. Such was the inspiration of his magnificent heroism, that, though fourteen out of twenty four of his platoon became casualties at an early stage, and six of his positions were over-run by the enemy, his men held on through twelve hours of continuous and fierce fighting until reinforcements arrived. If this Northern end of the hill had fallen, the rest of the hill would have been endangered, the beach-head dominated by the enemy, and other units farther inland cut off from their source of supplies. As it was, the final successful counter-attack was later launched from the vital ground which Lieutenant Knowland had taken such a gallant part in holding. 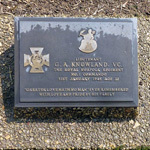 KNOWLAND, George Arthur, Lieut, VC. A testament by Jack Cox.